(Expert Software) 199x $? ? Cyber Troopers Virtual-On, known as Dennou Senki Virtual-On (電脳戦機バーチャロン) in Japan, is an arcade game initially created created for the Sega Model 2B CRX arcade platform by Sega AM3 in 1995. The release of sequels (specifically the Xbox 360 version of Dennou Senki Virtual-On: Force) has seen this entry in the series retroactively subtitled Operation Moongate (shortened to OMG) - this is a name occasionally referred to in Japanese merchandising but not within the game itself (and not overseas). The world is under new management. It is the age of economic feudalism; governments have been privatized, multinational conglomerates have carved the world into enterprise zones and sprawling business entities stretch their tentacles into every sector of public and private life. The delicate balace of power maintained by the rival trade consortiums was thrown awry when a lunar-core mining survey commissioned by the DN Group uncovered an extensive ruined outpost of incredible complexity and indeterminate age beneath the desolate surface of earth's moon. The DN Group appropriated esoteric machinery from the lunar ruins and implemented a revolutionary R&D program under the tighest security blanked - OT (OverTechnology) Systems. Years of secret research culminated in the development and release of a new line of neurally-directed combat droides with battleground precision and attack capabilities far beyond any mechanized warriors produced by the competition. OT Systems gave DN Group a total monopoly, cementing its dominance of the world economy. But, more disturbingly, the internal security programs of the lunar base were accidentally re-armed by DN Group technicians, unleashing virtual pandemonium on the surface of the moon. "Operation Moongate" was initiated to shut down the base before the chaos could extend to earth. The battle for control of the moon is underway, with OT Systems combat machines arrayed against the formidable remnants of the lunar complex defense forces. The DN Group forces have numerical superiority but are being tactically outclassed by the experienced droids defending the base. In a desperate effort to recruit talented virtual pilots, the DN Military Support Division has opened a Test and Training program designed to cultivated maxium combat skills in the shortest possible time. As one of thousands of test candidates, you must prove yourself in a simulation warfare against increasingly powerful DN test droids before qualifying for the Mindshift into real-time combat in teh lunar theater. Cyber Troopers Virtual-On is a versus fighting game featuring robots known as "Virtuaroids" who are armed with a variety of weapons. The game is played from a third-person perspective with players traversing across a three-dimensional field, attacking each other primarily with projectile weapons. Like other fighting games, the object of the game is to destroy all of your opponents in succession. The Temjin was the first prototype to be developed by the DN Group. This machine was made for stability and performance. An all-around fighting machine, what the Temjin might lack in advanced technologies, it makes up for with its reliability. The product of early experimentation with a stronger armored structure, the Dorkas is built slower than other droids, but packs a heavier punch. The long-range and obstacle-clearing power of its hammer attack make it a particularly tough customer in broken-field arenas. The Fei-Yen is the fastest of the DN Group droids, sleek and streamlined for high-speed maneuverability. The R&D team had to cut back on armor and heavy weapons, but the Fei-Yen is rumored to have a devastating secret attack system for last-ditch defense. Based on the popular Raiden battle-droid, the Belgdor is a slightly more mobile variant with a formidable homing missile system. The Belgdor doesn't have the one-punch KO capability of a Dorkas or Raiden, but it beats them both in speed and jumping range. Developed for fast tactical deployment, Viper II extends the Temjin prototype to a new level of quickness and agility. Sacrifices were made in the Viper II armor and close-range arsenal, but most machines have trouble getting close enough to hit one. The Bal-Bas-Bow was released well after the other DN Group battle droids, and it represents a new direction in virtual warfare tech-droids. With longer sustained jumping power and next-generation smart guidance weapons systems, the Bal-Bas-Bow may be the newest stage in battle-droid evolution. The Apharmd models are designed for use as guerilla shock-troops, with a paid of beam tonfas especially suited for hand-to-hand combat. Turbo speed and sturdy armor make the Apharmd droid a force to be reckoned with on any battleground. Raiden droids are feared equally for their dual laser cannons and their strontium-alloy armor. If these machines have a weak point, it's a lack of speed and jumping ability, but they don't need to spend much time trying to get out of anything's way. All Virtuaroids are powered by Sega Saturns. 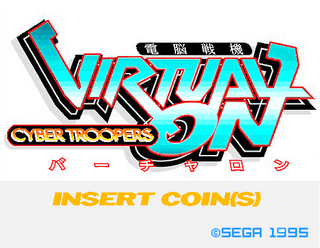 Main article: Cyber Troopers Virtual-On/Achievements. The success of the arcade game led to Cyber Troopers Virtual-On becoming a well established franchise in Japan, with plastic models, original soundtracks, trading figurines, light novels and audio drama CDs being among the merchandise released in this region. Virtual-On was also released as Sega Ages 2500 Series Vol. 31: Cyber Troopers Virtual-On in Japan with improved graphics, a better quality soundtrack and various other extra features. Two player online versions of the game were also released for the Sega Saturn version in America and Japan for the Sega NetLink and XB∀ND services. The game was followed up by a sequel in Cyber Troopers Virtual-On: Oratorio Tangram. Virtual-On was an extremely popular arcade game at the time of release, which led to the game being ported to the Sega Saturn with significant cutbacks the following year. The Saturn version makes cutbacks to accommodate the weaker graphical hardware over the Model 2 arcade board, but also adds a variety of modes not found in the arcade version. For the authentic arcade feel, Sega manufactured the Saturn Twin-Stick, of which the game was bundled with in Japan. While the control scheme can be replicated on a standard control pad, all six face buttons are utilised in addition to and . Conversely, the shape of the Twin-Stick means it is easier for players to understand which actions move their Virtuaroid, and which buttons fire. The Twin-Stick was never released outside of Japan, however plans seem to have been in place at one stage to release the perihperal in North America as a separate product, as it is both advertisedMedia:Virtualon sat us manual.pdf and its control scheme listed in the US manualMedia:Virtualon sat us manual.pdf. The Saturn version of the game aims for a 30FPS refresh rate (half that of the arcade) and uses an in-house engine not reliant on the Sega Graphics LibraryMore.... Most, though not all, of the underlying code (and to a lesser extent assets) were brought directly from the arcade versionMore.... Like Sega's Model 2-to-Saturn fighting game conversions, 3D polygonal backgrounds were replaced with 2D variants. The Saturn version also includes two split screen options, both "horizontal" and "vertical". 1997 also saw a Windows PC release derived from the Saturn game, however unlike previous Sega PC games, Virtual-On required a 166MHz Pentium MMX processor to run, which at the time was only available as part of high-end machinesMore.... Despite this, the game was unable to hit a stable frame rate with the recommended hardware, and 3D accelerator cards were not supported. In Japan compatibility for said cards was added, though no configuration matches the Model 2 version's visuals and performance (although the PC versions can output higher resolution graphics). Furthermore, no Twin-Stick-esque peripherals were available for PC owners at launch, meaning players usually had to resort to the keyboard. Special Thanks to: Hisaki Nimiya, Kazunari Shimamura, Shinichi Nakagawa, Takashi Hasegawa, Junichiro Tanabe, Publicity Section AM#2, Staff of "Ikebukuro Gigo", "Kamata Cinemagic", "Shinjuku Sportsland #3", "Hi-Tech Sega Shibuya", All Members of AM R&D Dept. #3, and All The Players of "Virtual-On"
Special Thanks: Original "Virtual-On" Staff, Sega AM#3 Dept., "Virtual-On" Saturn version Staff, Sega Digital Media Planning & Development Dept., Human Interface Communications (HIC), Yasushi Nagumo, Jun Kasahara, and ALL The Players of "Virtual-On"
Main article: Cyber Troopers Virtual-On/Magazine articles. Main article: Cyber Troopers Virtual-On/Promotional material.